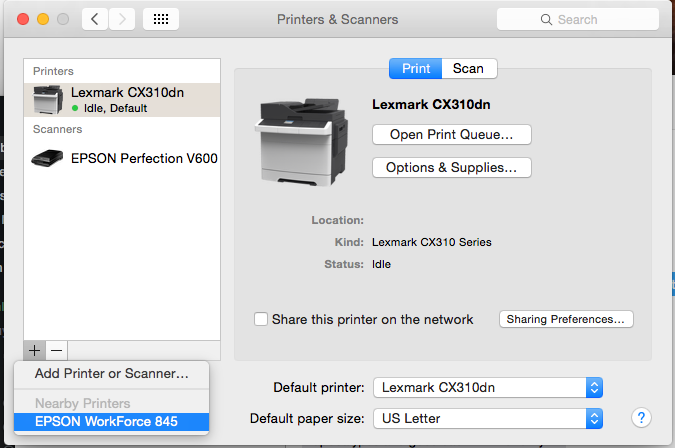 There’s no doubt whatsoever that AirPrint is very cool – hook up a printer to a network and your Mac or iOS device will quickly and easily find it and add it so you can print away. Easy and super for iOS devices especially. The problem is when you want to do more. 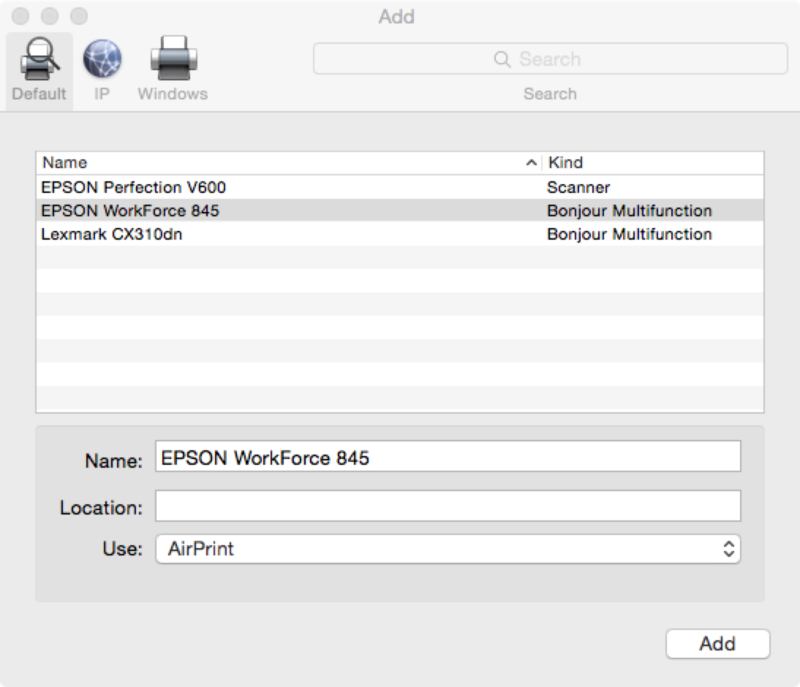 AirPrint is its own driver and feature set. So, say you have a printer with multiple trays or you want to utilize other functions of the printer? Maybe it has internal color matching? You need to use the real driver and not the AirPrint one. But how? Up until recently I had no idea I had this problem. 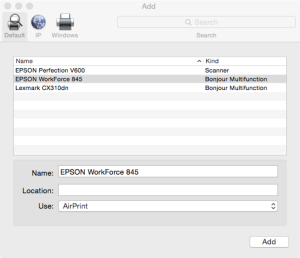 I have an Epson WorkForce 845 that I’ve used for a few years upset that I couldn’t print to the paper tray I wanted to. When I recently got a Lexmark CX310dn and my new add-on paper tray wasn’t being seen when I went to print, I dug into this more. I got this paper tray for a reason and it is going to work dammit! 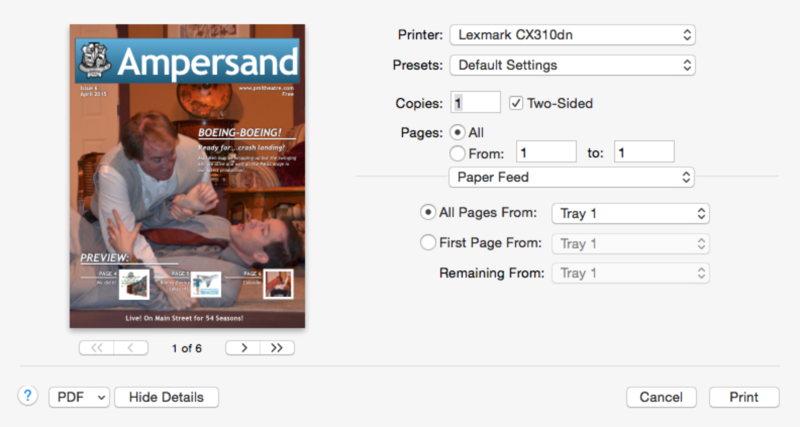 Turned out, it was AirPrint screwing me up. 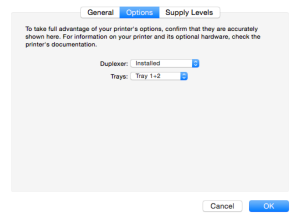 OS X cleverly shows the available printers it sees – but don’t trust it! 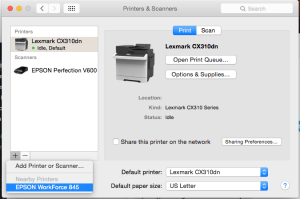 Whenever you want to add a printer to OS X now, if you don’t tell it otherwise, it will be hijacked by AirPrint. 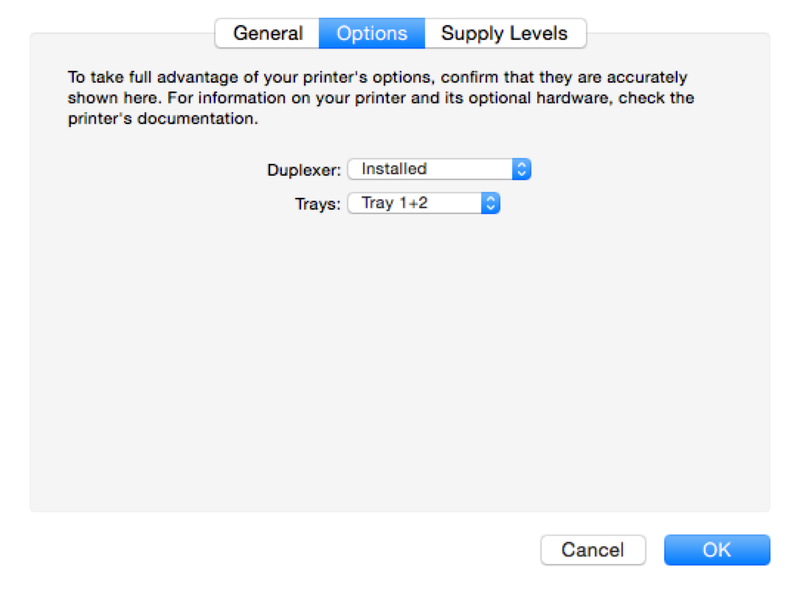 In fact, if you go to add a printer OS X is great that it shows you the printers it sees and aren’t set up. If you do it this way though, you’ll get stuck with the hobbled AirPrint driver. Apple really wants me to use this crummy AirPrint driver. Instead you need to hit that plus button and then pick “Add Printer or Scanner” to bring up the available printer lists. Even after you pick the printer though note it will still try to hobble you with that AirPrint driver! Now when I go into my printer and the “Options” tab magically the other cool options my printer has are displayed for me to select. AND, when I go to print now, I magically have a Paper Feed option menu so I can tell it how I would like to handle the paper. Yes, I love my Mac and OS X and I love how they make things easy for you. Sometimes they make it too easy though and you have to figure hidden things like this out. NOW I can route properly to my paper trays.